If you are an online shopping Kuwait retailer, it is imperative that you make adaptations based on the behaviors exhibited by your customers when they engage in online shopping activities. In February of the year 2014, the event known as the “Internet Retailer Conference and Exhibition” took place in Orlando, Florida. This event was referred to as the “IR Focus” and zoomed in on web design and mobile use among consumers who shopped with various internet retailers. Several individuals who specialized in online shopping took an avid interest in this conference simply because they want to have the competitive edge required to be a successful online shopping retailer within the Kuwait. One of the main advantages associated with pulling information from this event was that the online shopping retailers learned the importance of making adaptations to the design of their websites based on the behaviors of those customers that visited those websites. In this guide, you will learn many important facts that will assist you in optimizing your website so that you may achieve the highest level of success as an internet retailer. One of the most important facts presented at the exhibition is that consumers have made a dramatic shift from utilizing desktop and laptop computing devices to utilizing mobile devices in order to shop online. From the year 2010 to the year 2014, many behaviors have changed among consumers. The first is that the amount of time that internet users spend on the World Wide Web has literally doubled. This information was made possible by a popular firm that specializes in web measurements, called “ComScore Inc.”. This firm accounts this increase in time spent online to the increase in use of electronic tablet devices and smartphones. The next most important behavior that has changed that online shopping retailers must be aware of, is that the screen sizes used by consumers to access various retail websites has increased by two and a half times. This information was made available by the firm that specializes in online marketing, “Monetate Inc.” Based on this information, consumers that make an attempt to shop at Kuwait retailers through the internet are utilizing a broad range of devices such as electronic tablets, mobile phones with various screen sizes, and televisions that are connected to the World Wide Web that vary in size. The bottom line? The means and ways that internet shoppers are accessing Kuwait retail websites are changing and quickly and, in order to stay on top of the game, you must make the proper adaptations. According to numerous studies on consumer behaviors, it has been established that the power associated with technology and the explosive growth in the amount of individuals that utilize mobile devices to access the World Wide Web have totally redefined retail – especially online retail. As a result of this fact, online shopping retailers should place their focus on making it easy and convenient for mobile consumers to access products, browse, and complete shopping transactions online. However, many online shopping retailers within Kuwait are curious as to how to adapt to the needs of mobile consumers and still fulfill the needs of the computer consumer. The response is simple. 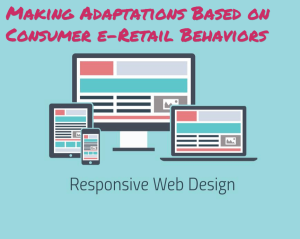 Retailers must place an emphasis on what is being called, “Responsive Design”. This is a type of design that allows a retailers website to instantly adapt to the type of screen that a consumer is utilizing to access that website. The speed of technology is rapidly evolving. If you specialize in online shopping in Kuwait, you must move fast to keep pace with the rapid evolving technology that you are electing to use in order to make your products available to consumers. Retail has now been redefined. In order to maintain a competitive edge among Kuwait consumers, you must completely redefine how you present and deliver your online store. By utilizing responsive design, you will succeed in this endeavor and reach higher levels of success than other online shopping retailers that build a website tailored to only computer users, or only to mobile device users. If you are a an online shopping retailer, it is imperative that you create a website using responsive design, and to ensure that the consumers that visit your website experience some degree of personalization. It is crucial that you ensure that your retail website is engineered in such a way that it is tailored to each internet user that visits the site. You will need to collect information that outlines what internet users are viewing, what they have purchased in the past, where the individual is located, what the user shares about themselves on social media platforms such as Facebook, and the searches that the user has conducted while on the World Wide Web. Naturally, to engineer a website that enhances a visitor’s level of personalization may prove to be an expensive endeavor; however, it has been established that Kuwait retailers that offer personalization in their website’s responsive design are likely to experience up to 50% more success in sales than their peers that do not integrate this into their retail websites. If you have a desire to reach high levels of success as a Kuwait online retailer, it is in your best interest to ensure that when a shopper enters into your website, there are products and recommendations ready and waiting to be shown to them. Traditionally, most online shopping stores had either one website that was meant for individuals using a wide array of devices to connect to, or, they had the problem of creating different websites for different devices. Both of these scenarios provided to be counterproductive and quite expensive for the retailer. Today, a retailer could have the complication of creating a website designed to appear on a screen of only 3 inches, and, tomorrow, they could face the issue of creating a website that would adjust to a screen of 70 inches. Why, with the emergence of new technology and the speed in which it is emerging, should you struggle to keep up with the latest viewing innovations on the market? By using responsive design, you have the ability to create one, single website that will view appropriately on a wide array of viewing devices. By avoiding the issue of having different websites created for different types of internet accessible devices that retailers may utilize to shop on your website, you will save your company a lot of time and a lot of money. While responsive design is considered to be complex in nature, it is much more complex to design and continuously update many different websites for various viewing platforms. In order to succeed in Kuwait as an online shopping retailer, you must adapt to the changing behaviors of the consumer. In taking this measure, you will find that you not only reap more rewards, but that you reap exceptionally larger rewards. Responsive design and personalization are two key components to gaining and maintaining the competitive retail edge as a Kuwait online shopping retailer in today’s fast-paced and technologically advanced world.